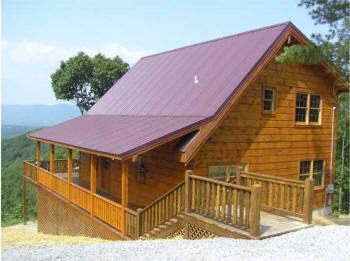 We named our New Crimson Star Log cabin after the red star of the south and for the burgundy metal roof we used on it. At the Crimson Star Log cabin you will find breathtaking views of the valley below and the mountains in the distance. There is no better view. The cabin sits on 2 acres of mountain land, which is close to the famous Shenandoah National Park. In fact a short hike from the cabin is a set of waterfalls, cool and refreshing. Relax and sit a spell on the covered porch or the open deck. Breathe in that fresh mountain air and be mesmerized by those awesome views. Something you will never forget. Enjoy a soothing soak in the unbelievable hot tub. It has 78 jets, LED lights, its own waterfall and even a built-in radio and a CD player with pop-up speakers, a truly unique experience. Time to eat? Grill out on the gas grill while watching the wildlife; see how many different birds you can count. We built the Crimson Star Log cabin with as many windows as we could. The whole cabin is flooded with sunlight. You get the feeling you are one with the outdoors. The cabin offers 2 baths, 2 bedrooms with 2 queen pillow top mattress and a queen futon sleeper. The cabin sleeps 4-6 comfortably. In the corner of the master bedroom is a very romantic 2 person Jacuzzi tub for those special evenings. The Crimson Star Log cabin is a top of the line cabin. The kitchen offers all high end touches. Hickory cabinets, stainless steel appliances including a dishwasher, and beautiful granite counter tops for ease of cleaning. All cookware, dishware, utensils and pots and pans are provided. The great room ceiling soars to 24 feet with exposed post and beams, no dry wall here. Sit and read awhile in our comfy overstuffed sofas, or enjoy a DVD movie from our big screen LCD flat panel TV. We also have satellite dish for crystal clear reception. The main focal point in the great room is the rock fireplace that reaches over 10 feet tall. Watch and stare as the flames dance on those cool evenings, making the cabin even cozier. Rest assure the cabins are clean. We clean them ourselves. We are a small owner of vacation cabins and we take pride in keeping them in shape. We also offer In-cabin massages, ask about pricing and details. Whether you just need to get away and relax or to celebrate a romantic weekend, the Crimson Star Log cabin is for you.